The Normal is Over Story | Normal Is Over. This is my story. These lines describe the birth of my life motto: Normal Is Over. How my grandma outlived Hitler, Moussilini, and Franco. Okay, so I’m nearly there. The story is starting read like something you can link together. The characters have some punch, some beauty, and some warts. There is almost enough flesh and bones on them to have coffee with them. My book is almost ready for the first harsh edit! Today I worked on the end of the book that brings me back to my grandmothers story of survival during world war two. I, the first child of refugees from Germany to be born in the USA, now work with refugees. I like that. Redemption is, in my opinion the most powerful word in the English language. How the story I was born into and continue to write, is being redeemed is one great example of why I feel so strongly about this word; about this quality of God. On the same day my grandmother, then 12 years old, went to school and her teacher, Mr Nabel handed out little swastikas to all the kids in her class. They were told to sing as loudly and enthusiastically as possible as this would make the right impression on the authorities. Mr Nabel was grandma’s favorite teacher, so with all hear heart, she sang for the glory of Nazi Germany. It would have been a great commercial for the Nazi party. My Jewish grandma singing her lungs out on a city-wide parade honoring Hitler. Hitler was leading the way to a prosperous 1000-year reign of the blue-eyed Third Reich. His promises included a quick fix to a very broken economy, the end of most social problems, and a Germany that asserts it’s position in the world as the ideal of beauty, culture, and strength. The German word for grandma is Omi. This is the only name I have ever used for my dads mother. She was Omi to me, not Karin Walbaum. Omi’s dad, my great grandfather, overheard a conversation on a train ride to work that the fire had been started by Jews, and that they were going to be rounded up and questioned. When he got to work, he told a friend what he had heard. This “indiscretion” got him in trouble with the Gestapo, who visited his house a few days later. He was warned that this “unfounded and vicious rumor regarding the Reichstag fire” must not be repeated. After a very uncomfortable day of interrogations, Mr. Fritz Walbaum, my great grandfather was sent home from Gestapo head quarters. Thinking he had convinced the officials that he had merely repeated what he had passively heard, he relaxed in his home, surrounded by family. 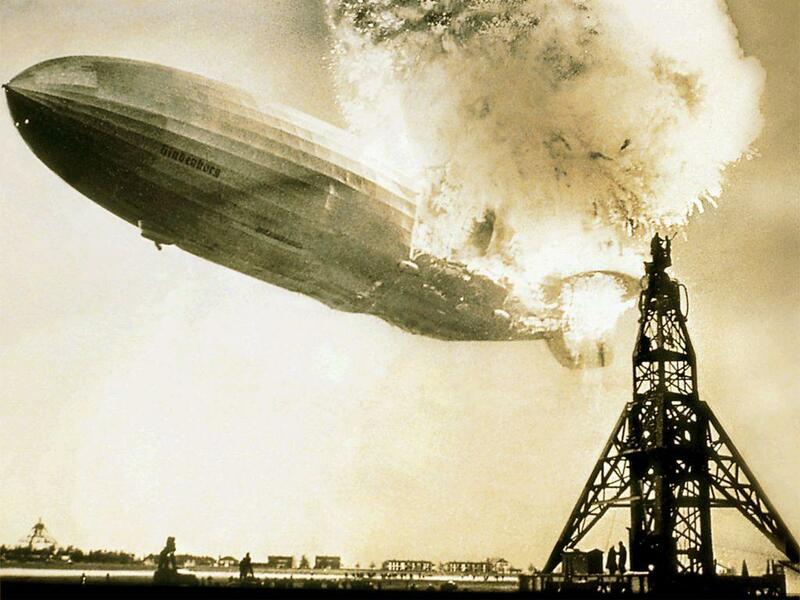 On April 20, 1933, the day Hitler celebrated his 40th birthday, my grandfather was fired from his job at AEG –the German arm of General Electric. On the same day the census office mandated a national tabulation of all residents of Germany. Omi had no idea that she was Jewish at the time. In fact, she believed her family to be Lutheran, as her fathers baptism suggested. Omi also didn’t know that under the current of German propaganda, ovens were being constructed for the removal of the race that Hitler believed deliberately brought on the great Depression and made Germany lose world war one. From the week that Omi and her family lost their job at AEG, they became refugees. They fled first to San Filiu de Guixols, a small village in North Eastern Spain. Great grandpa, under a pseudonym was translating AEG engineering documents from Spanish to German with the support of a lifelong friend in Berlin, barely making it month by month. In the summer of 1936 the Spanish civil war broke out, again displacing Omi and her family. With a skip through Berlin, Omi ended up in Italy where for a short time, Jews were safe from harm. They rented two rooms from “Mama Lovatti,” a widow with 5 children of her own. Bruno, her oldest son was 24 and irresistible according to Omi. On the 15th of November during a lunar eclipse, Omi was grabbed by Bruno and given her very first kiss. She was 17. In the fall of 1938, Mousilini made a bid of friendship with the Nazis by giving notice that in 6 months Jews would begin boarding the infamous trains North to Germany. Omi’s family of four (she had a younger brother, also named Fritz) was very fortunate to get permission to travel to Shang Hai, one of the last places granting visas to Jews during Hitlers Regime. On the way to Shang Hai the ship docked in Madras, India. Word spread on the ship that two visas were to be granted to Jews who wished to work in the home of an RAF family stationed there. Omi, at age 18, and her 13 year old brother got off the boat. When the war finally ended she was working for the same family. Then it was announced that all citizens of Germany living in India were to be put in POW facilities. Omi, hunted by her own country, then spent a year in a camp in Delhi as a German prisoner of war. She said it was fun. After her time in India she married a British royal air force officer, settled down in Surry and started a family. Of the three boys and two girls born in the UK, my dad, Pete Thomsett, was #___. And finally, to pursue the thirst for freedom and opportunity, in 1960-something, Omi and my grandfather to be, Ronald moved to San Francisco, California. Omi liked to introduce herself as a good bowler, a lifelong learner, and a woman who outlived three dictators. She told me to stop wearing bikini underwear after I got married. She said people who wear boxers are more likely to bear children. She really wanted great-grandkids. I don’t like boxers. Omi’s mom, my great grandmother, is said to have stayed alive just to hold me, the first free born child in their new homeland of the United States of America. I have a picture of her holding me just after I was born in the house mom refers to as the commune. She died that year. I, Steven Ronald Thomsett, was informally christened “Omi’s Angel” in March, 1968. 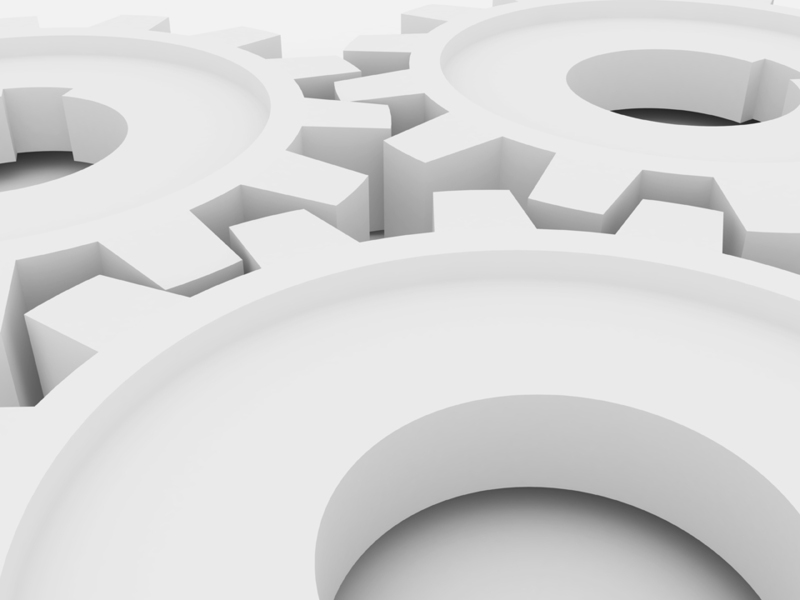 Am I a cog in the social machine? This morning, reading Eric Fromm’s The pathology of Normalcy I was challenged by a couple things. One, Fromm thinks humans are inherently lazy. Okay, that wasn’t so hard to accept. Two, he says that it is impossible for human beings to be happy when society has reduced him to a consumer. Our purely materialistic social norms lead us away from the possibility of significance. He wrote this in 1953. But here’s the big one, that normal is defined by society. 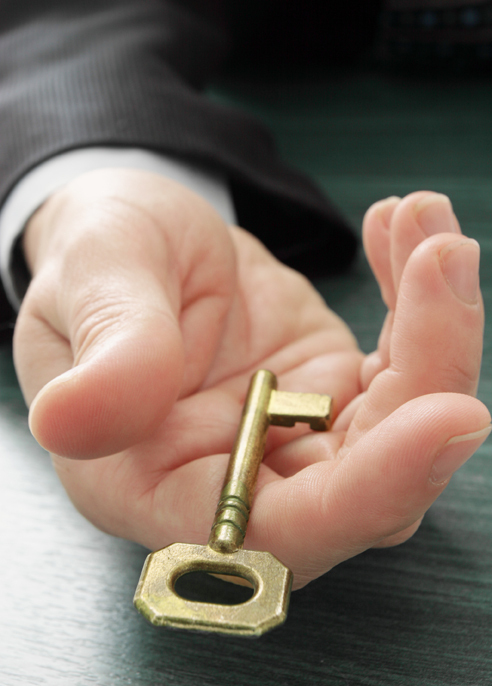 Whatever man or woman is needed to bolster society’s will is the ideal that we subconsciously become. We call the person who deviates from that system mentally unstable or abnormal. He takes it a step further. He points out that the data is conclusive that the wealthier and more developed a country is, the more mental problems like schizophrenia and anxiety disorders occur, the more sick people there are. This is not just because a developing country doesn’t keep good records. It is based on academic field research. To further explore these thoughts today, I re-read what I think is one of the most powerful revolutionary verses in the bible. The conditioned me fits in without consciously trying. It is an effort of will to cultivate awareness, to ask why I do what I do and what lies behind so many things I do without thinking. Where my mind and soul sleeps, my conditioned self thrives. My conditioned self acts as though attaining things and prestige will make me happy. I know from experience that this is a lie – yet in so many ways, I find myself conspiring against by deeper self and fitting in with “The world.” When I do that, I bury what truth there is between me and God. It makes me blind to His will. It makes me Normal. 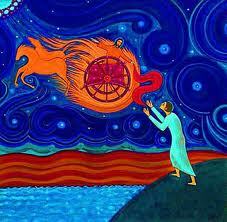 It’s midnight and I plan to have a dream that would make Carl Jung proud. Before I shut off my machine and brush my teeth, I’ll just say it one more time: Normal Is Over. The Brothers Karamazov is the best book I have ever read. I read it in Bangkok on early morning bus rides from Ratchada Pisek Road to Union Language School on Suriwongse road in 1987. I read it in coffee shops like the UCC in Robinsons department store on the intersection of Silom Road and the Rama 4 road, just in front of the Thai-Japanese overpass. Also, on the ascetic comfort of my coconut mattress at Bob and Thoi’s house, I read it in dim light with my window mounted air conditioner buzzing noisily. It’s Mike Cain’s fault. He gave me a list of essential books that an educated man should have on his shelf. Mike is the smartest person I had ever met. So I read my way through his list. I kept it in the back of my bible with check marks beside the ones I had finished. Mike was also a fan of Dostoyevsky. 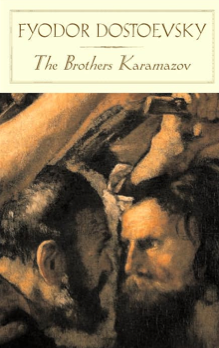 The Brothers Karamazov was the first book on the ‘to read’ list. Nearing the end of the story, I wished for more. I turned each page pensively, wishing they would reproduce like the loaves and fishes when Jesus fed 5000 people with two loaves of bread a few fish. On the last page I already wished for a selective memory eraser so that I could start it again with the same curious drive to get into Dmitri, Ivan, and the other characters brought to life by the Russian Master. I like the ‘What’s your favorite book’ game. Depending on the book, this small talk conversation can go deep fast. So when I take people to the border to visit Partners Relief & Development projects, I often make it part of the repertoire. You know that if someone choses a Bill Bryson book, the a Short History of Nearly Everything, that this is a smart person with a good sense of humor who likes to talk about mechanical stuff, who likes to learn. If they say the Hobbit, you know they have a rich imagination and are drawn to everyman metaphors. And if they say something like Tozers Pusuit of God, or Packers Knowing God, you know you have a deep one in the passengers seat; a person who you may love, or dislike intensely, so proceed with this talk cautiously. The ones who say the Bible is their favorite book usually haven’t read the Bible and don’t read other books either. That’s when I change the subject to other small talk conventions (like what’s your dessert-island-soundtrack) to avoid an awkward moment. Ok, so playing the favorite-book-game on a drive to Mae Sot a few years ago, I gave my standard answer. “My favorite book ever is the Brothers Karamazov by Fyodor Dostoyevsky.” That usually puts me in a serious position of conversational advantage. It makes me into the serious reader, the intellectual, the one who takes his reading seriously. I always go last. It impresses passengers. That hurt. Giggles from the back seat confirmed that my superior sense of culture was a farce. Kind of not fair actually. Because it was the best book I had ever read. But Oddny did have a point. If you can’t tell why it was a great book maybe you better chose a lower shelf. I read Douglas Coupland’s Life After God in a day. I can tell you what the book is about and why it made me cry. Maybe that should be my favorite book. Is it allowed to have a favorite book that you don’t remember the plot to, just the feeling of joy while reading it? It’s not easy. The pursuit of something finer than the daily grind is tough work. It’s tough because a dream has to be paid for. Any dreamer knows how expensive they can be. It is also tough because a dream will generally require that I live exposed to the possibility of failure, and that failure may be as painful to face as the dream is big. Question to self: do you really want to live like normal is over? “Change does not roll in on the wheels of inevitability, but comes through continuous struggle. And so we must straighten our backs and work for our freedom. A man can’t ride you unless your back is bent.” Martin Luther King Jr.
That’s it. The thing holding me back is me.I would like to blame someone else when I give up. And in my weakness, sometimes I do. But the thing is, the one making the decision to give up is not my scape goat, it is, in fact, myself. Note to self: be like MLK. Believe you were born for this day, this time, and that God is on the side of the risk taker, not the rule maker. 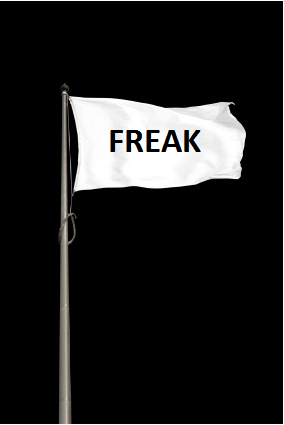 So I chose to fly the freak flag for one more day. The World says: fit or else. Why do you feel trapped? What is it that keeps you from breaking the bond of social machinery and doing one wonderful thing that everything in you says to do? That one thing is likely God’s will for your life. What keeps you from doing it? I know this is a stretch, but I propose that the apostle Paul and John Lennon have a lot in common. The major difference is that Paul offers a solution to the world system, or the ‘society-making-us-pressurized’, by recognizing Gods will. So it’s easier to smoke a joint. I admit it. Take a toke and everything is fine. At least for the next 15 minutes it is. But unless you stay high, the world system tumbles back in on you and crushes you with unbearable weight. If you don’t identify Gods will, you will be crushed. You can sedate it with some psychotropic exit plan or simply check out in a haze of disappointment and bitterness. That’s what I call normal. Or you can take the hand of the man who changed water to wine and learn to love life. It’s funny to me that the World we conform to, the World that kills our dreams and makes us fearful of risk, gets our intense loyalty. We give ourselves to the World and we get back what the World gives: nothing deeper than rearranged atomic particles that take shape in the form of a pad, pod, auto, or wallpaper texture. And what when we get it? Please, if this touches you, go and ask the next wealthy person you meet what makes him or her get up in the morning. Please do it! The ones I have asked have never answered that it is to get the World’s stuff, but to live a life of meaningful adventure – even if for one moment. That’s what we were built for and it’s what we all run into one way or another. Some days I would like to hit 5th in a Ferrari on a coastal highway. I would like to smoke a joint and gain a few minutes of freedom. But then I remind myself that the joy I seek is mine here and now. I only need a change of mind to get it back. I need to be “transformed” and stop viewing the World as my cage. The World is a defeated enemy. 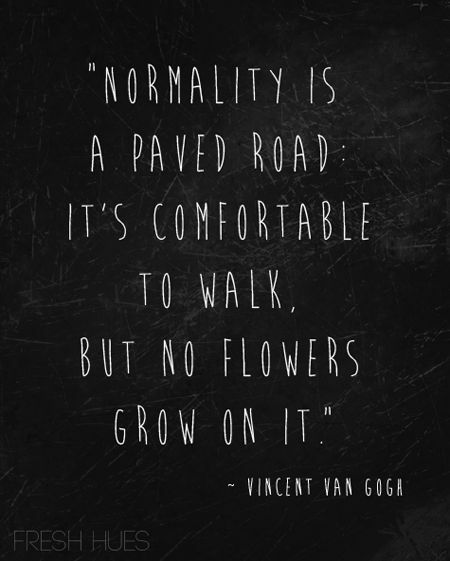 Normal is over friends. Sexual Violence. Suffering. Torture. Death. All these words took human form in Rose. She was not the perpetrator. She was the victim. The Burma Army had taken much of her most sacred possessions by force. First they took her home, then her country, then her purity, and finally, her husband. Instead of curling into a fetal position of grief and bitterness, she started helping orphans. That is of course a dramatic oversimplified version of her story. You can read more about Rose here. And click here to read about the day Rose died. 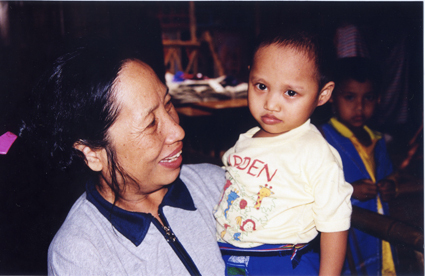 Rose holding Naw Mu Kapaw, one of the many orphaned children she took into her home in Sho Klo and then in Mae La refugee camps. 2003. The point is, Rose had every reason to hate the soldiers who took so much from her. That is why I was shocked when I went to her shack in 2003 and found a former Burma Army soldier eating lunch with the 60 + orphans and children that lived with Rose. Rose told me how he had come to Ma La Refugee camp earlier in the week, how he asked for asylum, begged for forgiveness. Nobody would listen to him. They wouldn’t give him shelter. They left him in front of the hospital to starve. One day a man passed by and had pity on him and suggested walking up the hill. “There’s a lady there who helps everyone.” He said to this young defector. Limping to Rose Mu’s shack, he called out to her and begged for mercy. She extended words that transformed him. “I forgive you.” She said. Having lived through hell on earth where her captors are the officers of this mans army, why did she end up taking him in when 30,000 other refugees (the refugee camp population at the time) refused the same? The soldier before her represented the destruction of life as she knew it. He was the symbol of everything wrong in that room, perhaps the very man who killed some of the mothers and fathers of those orphans eating lunch as I talked with Rose that afternoon. I looked over at the young Burmese soldier and felt inspired. He came begging for mercy and was granted it by the least likely person I knew of. He brought his wife and daughter to the refugee camp to live with Rose. They became Christ-followers too because they wanted more of the love they had met in Rose, and Rose credited Jesus as the source of her strength. He and his family lived with Rose until she died a year later. If you want to meet God, hang out with a lady like Rose. Are you worried about the saliva of a Samaritan woman? The crowd listened as a lawyer asked what he must do to inherit eternal life (only one of two instances in the gospels, the other one resulting in Jesus telling the rich young ruler to sell all he has and give to the poor). Jesus affirmed that he must love the Lord with all his heart and love his neighbor as he loves himself. When he started his story the crowd assumed the traveler to be Jewish, and also that the hero would end up being a farmer, rather than the religious elite. But Jesus has more up his sleeve than that. Rabbinical tradition at the time maintained that neighbor is your close physical/proximity relations and family. It’s the person whose walls sit beside the walls of your dwelling. Sadducees took it a notch further and made only other Sadducees eligible as neighbors. Anyone not falling into this slim category of neighbor was free game to rip off, cheat, and hate. Furthermore, specifically to this story, a priest would be unclean if so much as a shadow of a corpse touched his personage –neighbor or not. He amplifies the rule of love and the Christian code of conduct by making the greatest commandment back (the golden rule is the backbone of the Old Testament and the summary of the ten commandments.) into a mandate for all mankind, not just the Jews or religious elite. Not only does Jesus make the priest the chief offender in the story, he makes a Samaritan the hero! The Jews hated Samaritans. They were pure blood Jews who married Gentiles, making them all half-breed bastards. They were worse than gentiles because they knew better. They mocked Jewish tradition and belief by practicing a rival version of religion in God’s holy land. They claimed Mt. Gerazim the true place of worship and were the despised bottom of Israel’s social ladder. John 4:9 says that “Jews have no dealings with Samaritans” and when Samaritans refuse to give Jesus Lodging, James and John become so angry they beg Jesus to “destroy the village with fire.” (Luke 9:51-56). Jewish leaders called Jesus a “Samaritan” (John 8:48), a derogatory nickname reserved for the demon possessed. The saliva of a Samaritan woman was thought unclean, she was considered to be perpetually menstruating, and an overnight stay in Jewish villages made the whole community unclean. A Samaritans touch made food unclean, oil and wine contaminated. In other words, to Jews at this time, a good Samaritan is an oxymoron. There’s no such thing. And this Samaritan guy broke about a thousand little rules when he ministered this beaten soul, poured wine on his wounds (without tithing it as was required by the pharisaical law) and applying oil and love to his wounds. By introducing a radical new way of spirituality, one that had to do with acting on the impulse of love towards all mankind (not just my kind! ), Jesus redefined what religion in His time was all about. Tomorrow I’ll explain how this parable took on new significance for me when I watched a refugee woman (a widow who had been raped and tortured) forgive a Burma Army defector – her enemy. 1. Rose Mu, the refugee widow who helped me understand that simple faith acted on is powerful. 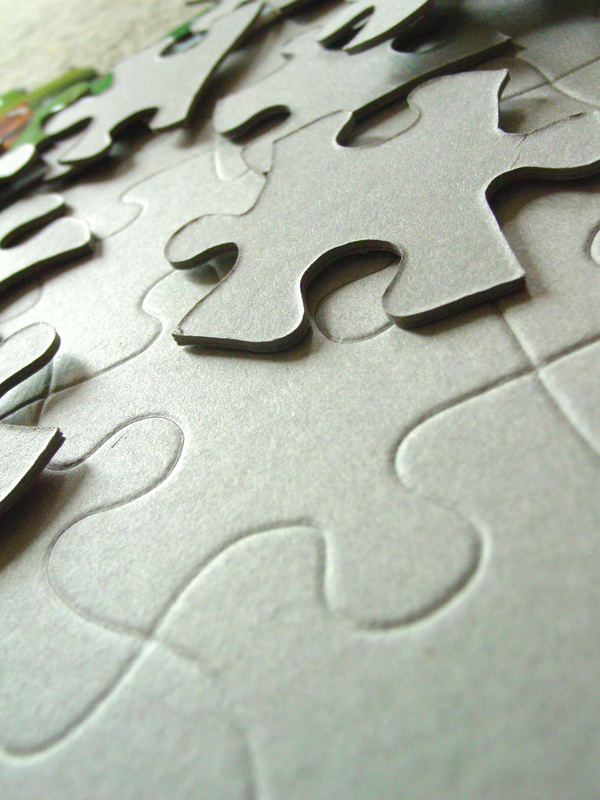 Complicated faith talked about is just an articulate form of deception. 2. My dad’s last days and the sting of regret he felt knowing that he was going to die before he even started to live. Dad’s story helped me understand the problem with fitting in and being normal. 3. My 22 year long romance with Oddny. She helped me set aside my fear of intimacy and openness to embrace my role as a husband, father, and friend on an entirely new level. Normal= living for the approval of others, weak marriage, absent fatherhood, no real friends, living for the weekend while working a job you hate, spiritual ambivalence and cynicism peppering every thought about a better life. Normal is a dreamless and passive state of resignation. It is death posing as life. I hope you are enjoying heaven and that the apostle Paul leaves you alone. He can be pretty tough on Jewish men who don’t take their heritage seriously and who don’t wake up to God knocking on their door until the clock is about to strike mortal midnight. Your death was a milestone for me. In so many ways it healed me and set me free. No, I’m not glad you died. However, I am glad for what looking at death did to you before you went into the afterlife, how it made you reach out to me and draw me into your thoughts, reflections, and story. As I told you that morning in Ferndale, ‘Dad’ was the name of my deepest childhood pain. As a child I knew that you loved me, but I also felt bruised by the adoption papers you signed. They stated in precise terms that you wanted nothing more to do with Steven Ronald Thomsett. Your signature made me into a Gumaer. It was so final. Then as an adult I began to wonder if you loved me at all. I know this is a bit self-centered to say, but when my first daughter was born in 1996 and I identified with feelings of fatherhood myself, I couldn’t understand how you could have let me go like you did. I told myself that I would never do that. Never. Now I know how complex the decision was for you, and I appreciate that it was a painful one, but still, this is how it felt. When you called me in Thailand back in 1998, I was standing in the front yard of a house we were about to sign a rental contract on. Oddny was pregnant with Naomi, and Elise was my little toddler buddy tugging at my pant legs. I asked the landlord to excuse me when the phone rang. You spoke hesitantly and told me you had a brain tumor and were given 3 months to live, time stood still for me. Did it stand still for you? Speechless, I mumbled something I can’t even remember and then agreed to visit you in Washington. As you know, I was working with refugees from Burma and felt like I was finding my feet in life helping them find theirs. (It’s weird how that works. You give yourself away and then begin to find yourself.) But I dropped everything, bought tickets, and touched down at SeaTac, rented a car, and drove North on I-5 to meet you in Ferndale. My clearest memory from that trip was when we sat staring into the embers of an hour old fire around seven in the morning. Cars were starting to pass your white house on their way to work in Bellingham or the small town of Ferndale. You had your wizened campfire face, laced with the nights tossing and turning, while you smoked a Marlboro Red and leaned back in your army green lawn chair. That kicked off a long talk about regret. I remember you telling me how you regretted that you let me go, that you kept working at a job you hated, how you wished you had kept close ties with past friends, and how you felt your intimacy with Laurel drifting. Your hunger to understand God and His ways spiked too, and I recall our talk about heaven and hell in a MacDonalds down in Bellingham. Weird place to realize how much Jesus loves you, wasn’t it? As you talked about regret, I thought to myself how odd it is that while you are physically sound, your neighbors will bad talk you for doing anything that deviates from the norm or is at all risky. But then, when you get diagnosed with cancer, the same neighbors stop by with a beef stew and encourage you to sew your wild oats, volunteer with refugees, and do a little living before you die. Is this neighbor code born of broken dreams? Is it because of their surrender to live in the margins of mundane and boring, but sensible and risk free existence? Is it because life is hard, fighting for dreams is terribly tough, and most people eventually give up, then turn on the dream and become dream’s enemy? I can barely articulate what your reflections meant to me dad. You talked about embraced yet unexamined values. You described for me what it felt like to face death knowing you had barely even lived. Terrifying. You helped me see this. Your reflections helped me understand that in our society we aren’t encouraged to live until we are about to die. Then, to see you stand up and own your new awareness was beautiful. The way you reached out to your wife, your kids, and your friends were very inspiring. I saw in those final months that your deepest spiritual core had been infused with new energy, new meaning. On the way home to Thailand I transited in San Francisco. Walking the terminal towards my gate I passed a 20-something kid who looked like he owned the world. His confident demeanor caught my eye. I loved his t-shirt. It said Boring is over. Walking past that kid I thought to myself that going with the flow is normal. Keeping a job you hate is normal. Getting divorced and remarried is normal. Living to retire, then being bored and without friends is normal. Being an absent father, normal too. Your story was proof. So I got back to Chiang Mai and printed my personal mission on a t-shirt. It says: Normal is over. Part of me still stands still in reverence when I think of you dad.